Quebec's opposition parties are calling on the government to renegotiate its bailout deal with Bombardier after the company announced it will be cutting 7,000 jobs. Quebec's opposition parties are calling on the government to renegotiate its bailout deal with Bombardier after the company announced it will be cutting 7,000 jobs, including 2,400 in the province. 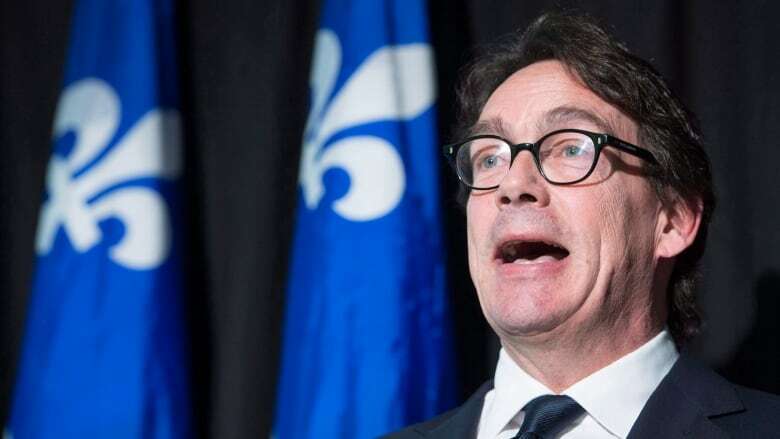 Parti Québécois Leader Pierre Karl Péladeau said Premier Philippe Couillard should call Prime Minister Justin Trudeau to ask for a lifeline for Bombardier — similar to Ontario's deal with the federal government over the auto industry bailout, said Péladeau at a news conference early Wednesday. Couillard stood by the provincial government's decision to help Bombardier with a $1.32-billion subsidy last fall. "We invested in the sector of Bombardier that is growing," Couillard told reporters. The government is investing the money in the company's CSeries jet, which is about two years behind schedule. Air Canada announced today it will buy up to 75 of the CS300 aircraft. Coalition Avenir Québec Leader François Legault said it's not too late for the government to renegotiate the bailout, since the money has not yet been delivered. "There are no guarantees on Bombardier's assets and there are no guarantees on jobs in Quebec and on keeping the headquarters in Quebec," Legault said. "It's the government's responsibility to get the best deal possible for taxpayers and to keep jobs here." The job cuts will begin at the Montreal-based aerospace and rail equipment company in the coming weeks and will be completed by 2017. 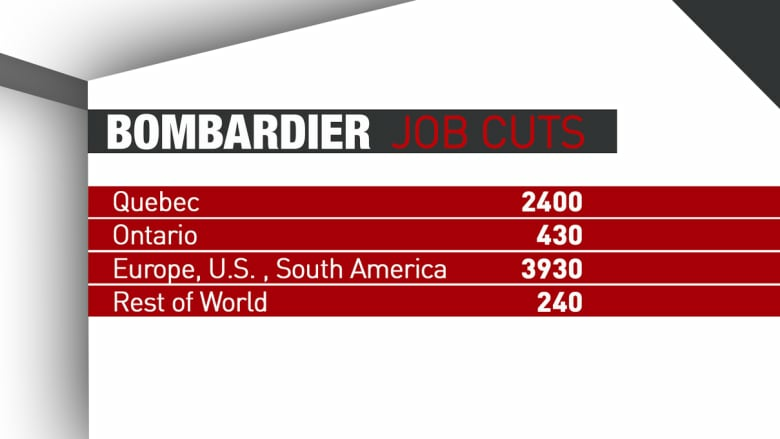 The International Association of Machinists and Aerospace Workers, which represents 4,500 workers in Quebec, says Bombardier's announcement is not a huge surprise, but it is a major concern. "There were rumours in the plants in past weeks, but the sheer size of the layoffs is quite a surprise and a blow to the membership," said the union's Quebec co-ordinator, David Chartrand. Local layoffs might be cushioned by an increase in manufacturing of CSeries jets, Chartrand said, but the union doesn't know who will be affected. "We will work for the members affected so that they can benefit, whether that be the opportunity of relocating or a training program that will let them find a job quickly," Chartrand, said. "We're looking at all possible options." On a mobile device? Tap here to see the infographic. A Montreal-based think-tank said a government bailout with strings attached would be a mistake, and urged leaders to let Bombardier restructure itself in peace. The Montreal Economic Institute says the company must respond to the reality of the market, which includes weak demand for its planes. "Artificially maintaining jobs that do not correspond to the company's current needs would be a mistake that, far from saving jobs, would ultimately end up destroying even more of them," economist Mathieu Bédard wrote. "Flexibility and the option of shedding a portion of its personnel, now redundant, are important preconditions for an eventual return to growth and sustainable employment."